These seed trials were a collaborative effort. 3 farms participated, and results were shared by Missouri University Extension. The seeds trialed were provided by University of Central Arkansas and had been collected from heirloom seed savers in the Ozarks of northern Arkansas. Below are the Varieties that were subject to seed trials , followed by brief summaries of conclusions about each one. Plants were very vigorous and easy to tend. Vines covered trellis, fencing and sunflower stalks, producing numerous 8 to 10 inch pods averaging 12 seeds per pod. 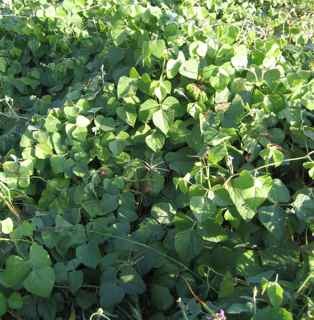 a reliable and productive cowpea, good for forage or soil improvement. This heirloom, brought from the Appalaichan region to the Ozarks, is also extremely vigorous, and climbed beyond the trellis into adjacent crop areas. 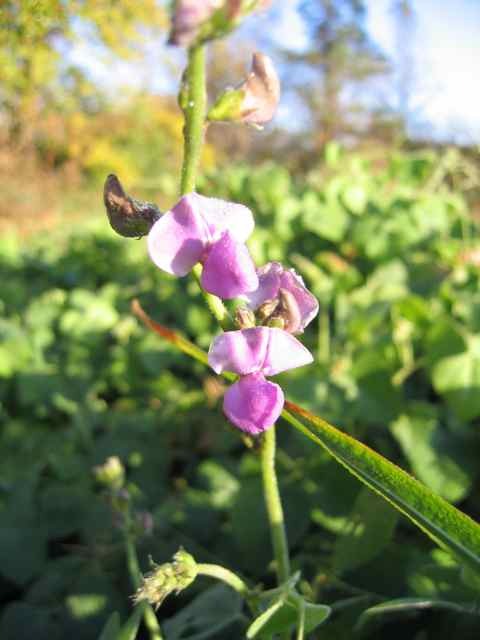 The plants produce 4” long, slender pods that can be eaten green but are best as dry peas. Dry peas are cream colored, 4- 6mm. with a darkish spot around the hilum. Plants are VERY productive, producing four pods at the end of the stems, and will produce a new set of pods even when the dry pods ares still on the plant. This productive pole bean provided continuous harvest - 3 pickings. I harvested 3 – 4” green beans from these plants for eating, then collected the dry beans for storage/planting. The green beans had very good flavor, but they did need to have the strings removed before cooking. The plants were very productive. crop description: small oblong dry bean, 13 – 14 mm. long, very pretty with bluish mottling and solid dark blue around the hilum and one end. Assessment: This was a very productive and useful climbing bean. In a very small space, it produced many easy-to-harvest green beans for a reliable and consistent long harvest. Hardy, easy to grow, didn't seem to have many insect or disease problems. Although there was a leaf footed bug that was seen on the plants, there wasn't a huge infestation and damage was minimal. Growing conditions: sandy soil amended with compost. It was intended that seed would be evaluated and perhaps saved, and from 09 trials, it was learned that a long season was needed for seeds to flower form. The same result occured in 2010; thick and vigorous mat of vines had no susceptibility to drought, unlike other legumes, however the plants were slow to flower. Flower formation was delayed into near frost dates, and pods never set on stems. Conclusions are that Lab Lab appears to be a very effective cover crop, and perhaps forage, but seed crop requires a long season. soil conditions, very sandy, well drained river bottom. Grown organically. Irrigation: soaker hoses used once per week in mid summer. Mulched with hay, to retain moisture and reduce the need for watering. Semanka melon is remarkable for its coloring and size and flavor as well. Melons are small averaging 7 or 8 inches across, and uniformly pale yellow inside and out. the skin has some marbelling (or "netting" as one would see on a muskmelon), but this seemed to be a genetic variation, with some fruits bearing a smooth skin, while others were rough. selection of fruits the second year focused on smooth skin melons. This was a very reliable melon type and required minimal care. there were flea beetles present early in the season, which caused some leaf damage, but plants endured after beetles were gone, and continued to set 5 or 6 melons per plant. An exceptional variety. growing conditions: planted in greenhouses. rich soil fertilized with composted cow manure and hay. greenhouses had no shade cloth, or fan ventiliation. Irrigation: watered by hand with hose daily or every other day. 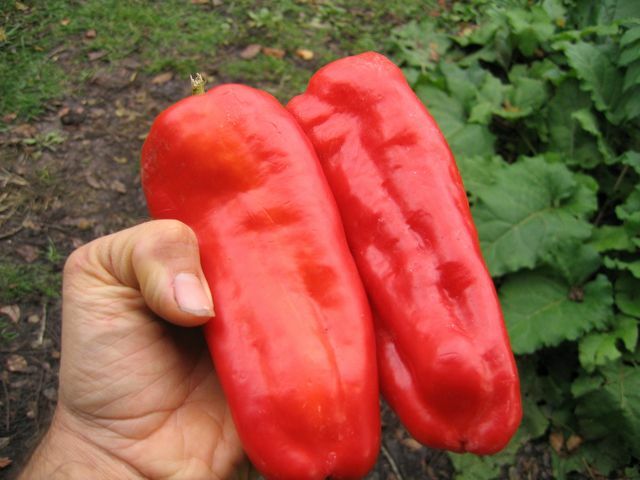 The name of this pepper apparently derives from its multicolored fruits. flowers are white or purple, and tiny peppers start green, then turn purple, orange and finally red. Unique appearance could almost make them a novelty or ornamental plant. The peppers are very flavorful and hot when eaten. This was a trouble free variety, undisturbed by insects or temperature and moisture fluxuations. This variety needs as much water and care as most common leek varieties, but with an unusual and very helpful added benefit: They multiply from the root, as well as setting small seedlings from their round seed heads. Because the plant reproduces in these three ways, the usually lenghty process of starting new seedlings is vastly reduced. countless seedlings have matured to the month old or six week stage when the crop is finished, so successions are easy to maintain and a continuous crop takes little effort. Seeds are very numerous, so a small planting or 5 or 10 leeks, if left for seed, will give enough seed for several thousand new plants. did not require excessive irrigation. Trials planted in 2 circumstances: one was outdoors in a sandy soil amended with composted cow manure and irrigated with soaker hose; the other trial was inside greenhouse with overhead water daily. The celery performed well in both circumstances, although the plants receiving heavy water in the greenhouse flourished, reaching twice the size and continuing to become a 4 foot tall bush producing plentiful seed. It is nor clear what the name self blanching might refer to; the plants outdoors did strart to go white as the summer heat set in, but that appeared to be an indication of failing plant health, rather than a natural transition in color. The vegetables outsde had stalks about 8 to 10 inches long, with plenty of leaf. A modest crop, not very productive, but flavorful and not a very demanding crop, other than needing good weeding at the start and steady irrigation as they mature. Outside spacing was 8 inches, and this appeared to be almost too close as the plants reached full size. ( between plants and between rows). This is a bush type tomato, with short stocky plants that bear an average 8 or 10 fist size tomatoes per plant. The plants become very substantial, although short, and staking is definitely required as the fruit starts to set. The tomatoes are a slicing type and similar to other heirlooms, with a more fragile skin than is expected from most commercial tomatoes that are shipped significant distances to market. For a local market farmer, however they could be worthwhile because of the favorable quality of the flavor, size and appearance. 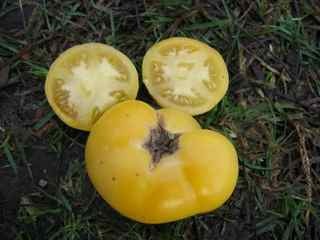 The tomatoes are pale yellow and mid-sized to large. 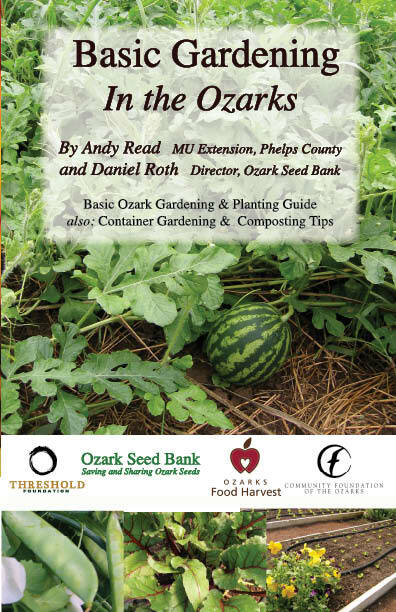 Growing Conditions: normal garden soil for the Ozarks: ~6 – 8”of soil on top of gravelly subsoil, amended with compost and rabbit manure. These plants grew very large, like little trees. The stem/trunk measured 1” - 1 7/8” in diameter at the base, and the overall height ranged from 4' – 6'. Flowering and fruiting was delayed, compromising the harvest. By the time the plants were fruiting, the weather became too cold for continued production. The first frost was the night of October 26, and the outer leaves were damaged. The plant subsequently grew more leaves, and the pods that were left on the plants persisted but did not grow bigger. I planted late (July 1) for this large a plant. It needed 3 months to grow to maturity before producing fruit. I harvested 3” okra pods to fill 2 quart jars (for pickles) and the rest of the pods were left for seed. The plants flowered and fruited late. Growing Conditions: greenhouse; fertile, sandy soil amended with composted cow manure and hay. Irrigation: daily overhead watering. This basil was very prolific and experienced no disease or insect problems. It thrived through the summer, and went to flower after the hottest part of the season. Extremely plentiful seed from bery few plants. As plants dried, seed released from stems were well formed and of high germination. a good seed saver, and a consistantly flavorful herb. Growing Conditions: riverbottom field with no amendments, irrigated twice as a seedling, then no added water. fenced from deer. This gourd was aggressive as a vine, though only a handful of plants were started. The expansion of the vine crept 20 feet or more in diameter, and managed to cover other watermelon and squash vines. It produced 10 to 12 gourds per plant, and might produce much more if grown with irrigation. The plant required almost no maintanence, not much weeding, and not much squash bug removal. Squash bugs were present, but not problematic. On 2 occasions, leaves were checked for squash bug eggs, with eggs removed as they were discovered. The insects subsided after this. The gourds averaged 15 inches in length, much smaller than the name would suggest, which perhaps indicates again that a different outcome would result from more watering, or perhaps more fertility of the soil. did well, considering the hot dry summer. and the taste was not very good. about 6 inches with 5-6 light brown seeds per pod. The taste was good. Seed obtained from Conway AR. and flower more than compensated for the lack lack-luster taste. Seed obtained from Conway Arkansas. from a Seed Swap in Mt Home, Ar. Early Hanover: Germination was good. A hard year for melons because the hot and dry conditions. Plants were vigorous and the fruit small to medium with thin flesh. Very tasty.